In the piece, there's a good performance/auditioning tip: Think of the camera as just another person. Ah, the ol' "smile with your eyes." 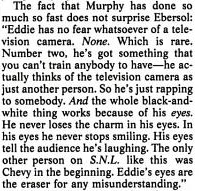 Joe Piscopo also talks about Murphy's smile/vulnerability. More clips of Eddie on SNL.